ਇਹ ਸਫ਼ਾ ਅੰਗਰੇਜ਼ੀ ਵਿਚ ਇਸ ਵੇਲੇ ਉਪਲੱਬਧ ਨਹੀ ਹੈ. 7 AM Good morning! The chickens are scratching outside our trailer as we struggle out of bed, and stagger over to the storeroom for staff devotions. This time of seeking God's face has helped us keep the unity and passion among the Buenas Nuevas staff. 9 AM Soon the clanging cowbell lets us know that the meal is ready, prepared by some of the 80 people living in tents and the dorms. After breakfast another team cleans the kitchen while Dave and the worship team set up the mikes and speakers for the devotional. 10 AM Songs, guest speakers, prophecies, and testimonies of the wonderful things that God has done in the camps make time fly until we break up for work assignments. 12 PM The storeroom is a beehive of activity as six teams turn in requests for Bibles, NTs, blank cassettes and CDs, tracts, and Jesus films in over 60 languages to replace what was sold or given out the night before. All the equipment in the vehicles-video projectors, sound system, cassette and CD duplicators, power supplies-has to be cleaned, checked and stored before going out. The maintenance teams are busy cleaning bathrooms, grooming the grounds, repairing the plumbing, and ensuring the smooth flow of people and goods. The shoppers have gone to town to restock the kitchen and storeroom, and the delicious smells of lunch waft from the kitchen. Gerry is meeting with the team leaders to pick camps for that week's visits and to coordinate the work. Dave is troubleshooting equipment for the teams and drivers. 2 PM The cry goes out, "A COMER" and we line up for our plates and glasses. Perhaps a plastic plate lined with a plastic bag (to be tossed after the meal) is not your idea of fine dining, but it does save time. 3:30 PM Often there are visitors from local churches and other ministries who join us for prayer before going out to the migrant camps. The sight of a hundred warriors dressed and ready for battle is awesome! With the Lord going before us, the battle has been won to rescue hundreds of souls from the darkness they inhabit. 4 PM The vehicles spread out to the north, south, east and west of Campo Esperanza, singing, praying, and declaring that Jesus IS the Lord of the camps. Every night we pray for dozens of people in their rooms, at the wash areas, and in the open spaces where we show the Jesus film. There is a great hunger and thirst for God's healing, peace, provision, protection, and salvation among the people in the camps. The visits, audio material, films, and prayers of the past 18 years have opened to God's love the hearts of people from over 500 villages in Mexico. 4:30 PM As we arrive at the camps, the people get off the buses or trucks that carry them from the fields. Streams of Indians pour through each camp, eager to wash off the thick layer of plant sap that coats their hands and arms. The women begin to make supper and the tortillas for the next day, then go wash clothes in the communal cement wash tubs. The toilets consist of a hole in a cement slab, with a cold water faucet in the ceiling that doubles as the shower. Watch where you step! The houses are blocks of 10 or 30 rooms butted up against each other, with a small porch that serves as the kitchen. The stove consists of either sticks on the ground, a built-up cement fire table, or a two-burner propane stove. Some modern camps have cement bunks, in the rest rope beds or sheets of cardboard keep people off the bare floor. The furniture consists of five-gallon buckets used to carry the picked produce to the trucks - upended in the house they serve as make-shift tables and chairs. One of the most annoying parts of putting so many people together is the noise - radios and boom boxes blast out most of the evening. But when we give out CDs in Mixteco, Nahuatl, or Zapoteco, it's such a blessing to hear God's message coming from house after house, bringing light and healing. 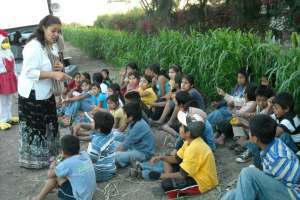 5 PM Part of the Culiacan Project team works with the children in the camps, teaching Bible stories and songs, and working with crafts. Some stay with the vehicle to set up the projection system and show videos after dark. The rest go door to door discovering what language is spoken in each home, and giving out the appropriate cassette or CD. This year in our time there we gave out over 7,000 in more than 130 languages,. It was very difficult to carry two sets of media, two sets of originals (masters), and 2 duplication systems, but God gave us special wisdom and strength. 8 PM After the videos we give an invitation for those who want prayer or salvation, and we minister to each of the hundreds of people who come forward. It is so moving to see a crowd of 300 or 400 people who have worked for 10 hours, stand for another 90 minutes and then come for prayer and the touch of God in their lives. After ministering to all who want prayer, and writing down their names, we break up the equipment, stow it all in the vehicle, and head out the gate, rejoicing in the blessings of God. 10 PM A few people have stayed behind in Campo Esperanza, praying for the night's work and making supper. When the teams begin to pull into camp, they pray and commit the work to God, and then shout, 'Amen, y al sarten' which means, 'Amen, and let's hit the skillet!' The camaraderie over a light snack is wonderful as we share about the miracles, healings, and restless children calmed as we carry God's light to the camps. 11 PM After checking our email, we are tucked into bed, dreaming about another day of work and blessing in Campo Esperanza.